4.2 out of 5 based on 28 bloggers and 6 commenters. 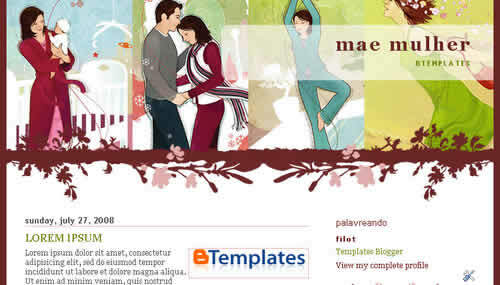 Mae Mulher is a free blogger template with 2 columns, right sidebar and floral motifs. Excellent template for blogs about to write a diary, fashion or people. yeah! If only it was a little bit wider and had 3 columns on both sides… it would be perfect. Oh and if somebody could change the formatting of comment appearance under the post. Did I make it clear or it’s just my poor English? I really liked this one for my personal Blog. I downloaded it but it doesn’t work. I’m not quite sure why not. I think the links on my Blog and the Sitemeter can’t work in this one, is that right? Just wanted to say that i love this layout! It is perfect for what I was doing, and easy to get working. Thanks a ton, and keep up the good work! Well, I haven’t forgotten this template and I gave it a second chance. It didn’t worked the first time because all the gadges were gone and I got totally confused. Then I realized I had to do it all over again and now I’m using it, it really looks great, thank you! i’m using this one right now. it’s nice. tq. i wonder how many languages do u speak…? i can see different languages in the comments and layout header.